This is a variation on the easy handmade paper process. Instead of making smooth sheets of handmade paper, this technique uses rubber stamps to impress the surface of the wet paper pulp. The textured surface can be left plain or highlighted when the paper is dry using pigment powders. This technique can be easily adapted and can be used to create festive ornaments, unusual gift tags, decorations for a wedding or party and much more. Use rubber stamps with deep impressions for the best results. You can also use this technique to make textured plantable seed paper. Make paper pulp. 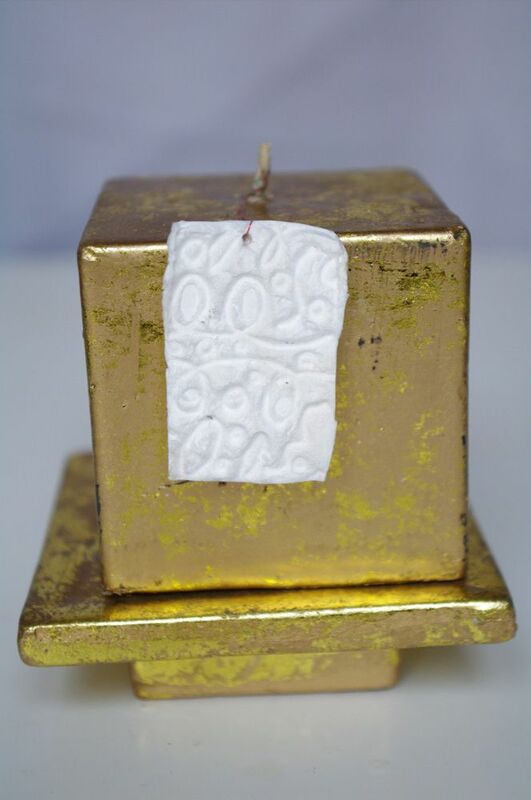 There are two ways to use rubber stamps to texture the surface of handmade paper. One way is to press the stamp into the surface of the paper, the other is to press the paper into the surface of the stamp. I have used the second method here. I pressed the wet paper pulp into the surface of the stamp and this gives a deeper and more defined image. Of course, this creates much smaller pieces of paper as the paper is limited by the size of the stamp. However, for gift tags, card embellishments or other small projects then this is fine. Choose whichever method best suits your required results. Remove the paper from the rubber stamp and leave it somewhere dry and warm to dry. When the paper is dry it can be decorated further as required. The surface of the textured handmade paper in the photograph above has been dusted with pigment powders. Use the finished textured paper to make gift tags, embellishments for handmade cards or as decorations for parties, weddings, and other celebrations.